See the 2018 prize money winners and Joey Chestnut's net worth. Joey Chestnut set a new world record and became the 2018 Nathan’s Hot Dog Eating Contest champion, winning his 11th Mustard Belt after consuming 74 hot dogs and buns (HDBs) in a thrilling 10 min. The previous record of 73.5 HDBs was also set by Chestnut. Miki Sudo won the 2018 women’s division title and Nathan’s Pink Belt for the fifth time in a row, scarfing down an astonishing 37 HDBs in 10 min. Chestnut can relish his victory having put some real mustard on his effort. He ended up besting Carmen Cincotti’s second place effort of 63 HDBs by 11, meaning Cincotti will now have to avoid being sauerkraut about his loss. Take a break from your barbecue to learn more about the Nathan’s Hot Dog Eating Contest’s competitors, their net worths and career earnings, and fun Nathan’s hot dog stats to share with your friends over the grill. Rank Name Prize HDBs Consumed in 10 min. Rankings according to Major League Eating as of 3:30 p.m. PT, July 4, 2018. The annual 4th of July Nathan’s Hot Dog Eating Contest is one of the most famous eating contests in the world, where professional eaters compete for big money and competitive eating fame. You can watch replays of the event on the ESPN App. Sudo — who, according to announcer George Shea predates the existence of light and sound — crushed the competition, beating out Michelle Lesco with 27 HDBs, Sonya Thomas and Juliet Lee tying for third with 25. Read on to see the net worths of Joey Chestnut and other Nathan’s Hot Dog Eating Contest winners, their total career winnings, and more. Major League Eating (MLE) — the organization that oversees professional eating contests — began paying cash prizes to top finishers in 2007. In 2018, the total prize money is $40,000: The men’s division winners get $20,000, and the women’s division winners get $20,000. Among those two groups, the $20,000 is broken down five ways according to how competitors place. Additionally, the men’s champion is awarded the bejeweled mustard belt, and the women’s champion is awarded a bejeweled pink belt. In 2017, an estimated 35,000 attendees and 1.11 million viewers on ESPN watched as competitive eaters Joey “Jaws” Chestnut and Miki Sudo devoured the most hot dogs and buns to come out on top. Chestnut gobbled 72 HDBs for the 2017 men’s title — and fell just 1.5 HDBs short of his own record of 73.5 — and Sudo devoured 41 HDBs to conquer the women’s division, both in a mere 10 minutes. ESPN’s Adam Amin provided the play-by-play for the 2018 eating competition. In-depth analysis was provided by Major League Eating’s George Shea. Not just anyone can enter this eating contest. Contestants must compete in one of at least 10 qualifying events held from March to June in various cities across the U.S. to earn a chance at the Nathan’s Hot Dog Eating Contest prize money. A handful of eaters have dominated the Nathan’s Hot Dog Contest in recent years, with reigning champion Joey Chestnut claiming 11 of the last 12 titles in the men’s division — the lone blemish was a loss to Matt Stonie in 2015. And Chestnut’s streak started when he broke a run of six straight titles for Takeru Kobayashi from 2001-2006. 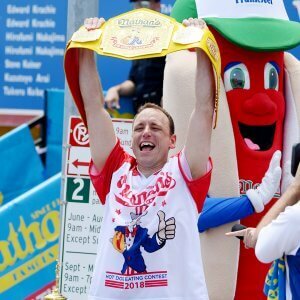 Returning champion Joey Chestnut was heavily favored going into the 2018 event with a lot riding on him: ESPN estimated that more than $1 million would be bet on the hot dog eating contest by the time it kicked off on July 4th, with Chestnut coming in as a massive favorite at -700 — meaning you would have to wager $700 just to win $100. At the pre-event weigh-in on July 3, Chestnut pointed out that — not only is he the 10-time champ — but the diminutive size of his main rival Carmen Cincotti could hurt his chances. Chestnut also said there was a potential he could break his own record this year, stating that he’s been eating 75 HDBs in his practice runs, according to the New York Post. Chestnut fasted in the days leading up to the contest, according to the event announcers. Meanwhile, on the women’s side, only two people have ever won the title since MLE began awarding it in 2011. 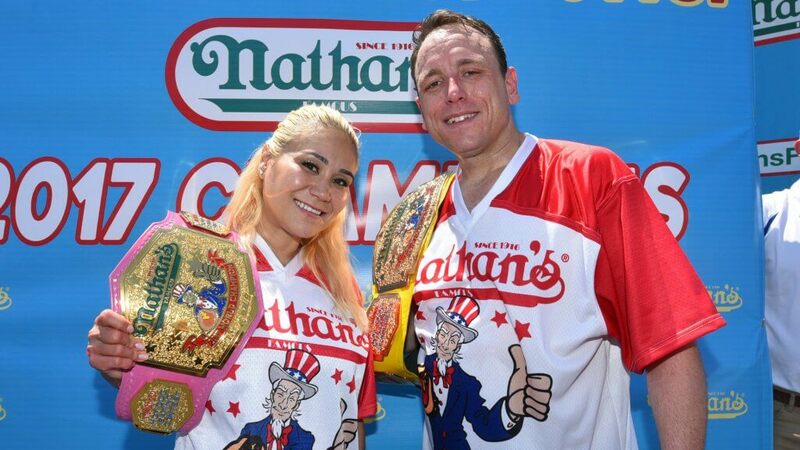 Sonya Thomas won the first three titles — setting the current women’s world record of 45 HDBs in 2012 — before giving way to Miki Sudo, who has won the last five Nathan’s Hot Dog Eating Contest titles. Sudo expressed concern about the weather at her weigh-in, specifically the humidity, which the Las Vegas native has less experience with. She also said that she had no plans to alter her approach of eating two hot dogs separately before consuming two buns separately, citing her victory last year as proof of its efficacy. Here’s everything you need to know about the competitive eating at the 2018 July 4th eating contest. Joey “Jaws” Chestnut surprised no one by cruising to his 11th Mustard Belt in 12 years, extending a stretch of dominance that has defined his sport for over a decade. He might have surprised some, though, by consuming 74 HDBs for the new record despite a hot, humid day in Brooklyn. The top-ranked competitive eater in the world, Chestnut ate 72 HDBs to win the 2017 Nathan’s Hot Dog Eating Contest. The California native and former construction manager has dominated the competition at Nathan’s Famous 4th of July Hot Dog Eating Contest, having won every single year he has entered, save for finishing second in 2015 by a mere two HDBs. Joey Chestnut’s net worth is $800,000, according to Celebrity Net Worth. Chestnut is arguably one of the most famous and successful professional competitive eaters. He just launched a new line of condiments in time for the 4th of July, reported USA Today. The new Joey Chestnut Select product line includes Chestnut’s Firecracker Mustard, Boardwalk Coney Sauce and Deli-Style Mustard. All profits from the online product sales through July 6, 2018, will go to benefit Hidden Heroes, the Elizabeth Dole Foundation’s program for assisting wounded warriors, according to PR Newswire. Miki Sudo continued her abject dominance of the women’s hot dog eating field — winning her fifth title in a row — but she did fall short of matching last year’s 41 hot dogs or the record of 45 set by Sonya Thomas in 2012. Last year, Sudo’s 41 HDBs bested Michelle Lesco’s 32.5 HDBs and Thomas’ 30 HDBs. Sudo first qualified for the annual 4th of July contest in 2013 by downing 40 hot dogs at the New York New York casino in Las Vegas, a feat that clearly didn’t take too much of a toll on her as she then downed 7.5 pounds of deep-fried asparagus in Stockton, Calif., the next week. And although she failed to top Thomas that year, she won the next year and hasn’t surrendered the Nathan’s Pink Belt since. Sudo holds world records for eating 16.5 pints of vanilla ice cream in just six minutes at the Indiana State Fair in 2017 and for downing a stunning 8.5 pounds of kimchi at the Chicago Korean Festival in 2013. Sudo’s Major League Eating career winnings total is $119,911. Cincotti isn’t a one-trick pony, though. He set a world record by consuming a staggering 2.438 gallons of chili at the Orlando Chili Cookoff in February 2018 — the fourth world record he has set since October 2016. He also holds the record for eating brats, downing 101 at the Linde Oktoberfest Tulsa in October 2016; croquetas, eating 158 in Miami in March 2017; and sweet corn, downing a stunning 61.75 ears just a month after setting the croquetas record. Over the course of his MLE competitive career, he has won a total of $44,150. The third-ranked eater in the world is Matt Stonie, and he remains the only person who has ever managed to best Chestnut in the 4th of July Hot Dog Eating Contest. He fell short this year, though, finishing off of the podium as Darron Breeden climbed into third by just one HDB. 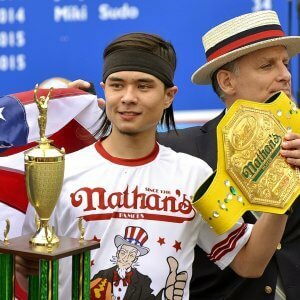 Matt Stonie’s net worth is $700,000, according to Celebrity Net Worth. The No. 2 female eater in the world, Michelle “Cardboard Shell” Lesco gave it her all this year but still failed to keep pace with the storming pace set by Sudo — missing victory and another $5,000 by a full nine hot dogs. The marks the second year in a row she has finished second, losing to Sudo in 2017 as well. She is currently the second-ranked female competitive eater in the world and the ninth-ranked eater overall. Lesco, who hails from Tucson, Ariz., is also MLE’s 2017 Humanitarian of the Year, working as the senior manager of youth services at the Volunteer Center of Southern Arizona and helping to fund wells in the Central African Republic and Ethiopia. She has won $48,675 in career winnings as a competitive major league eater. 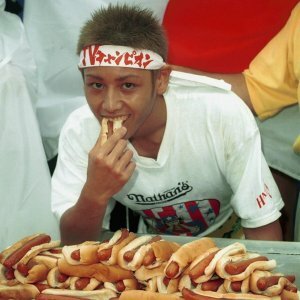 Takeru “The Prince” Kobayashi changed competitive hot dog eating forever when he guzzled 50 hot dogs in 2001 — double the number the previous year’s winner had eaten. That year, he debuted his new technique of dipping the buns in water to break down the starches, something most competitors now replicate. Kobayashi won six consecutive Nathan’s Hot Dog Eating Contests (2001-2006) before he was overthrown by Chestnut in 2007. He tied with Chestnut by eating 59 hot dogs in 2008 but was declared the second-place winner after Chestnut was the first to finish a plate of five hot dogs in the first-ever overtime. Kobayashi hasn’t competed in the 4th of July Nathan’s Hot Dog Eating Contest since 2009 due to a contract dispute with MLE, though he did manage to make it onto the stage in 2010, albeit briefly, storming the competition in protest, only to be arrested. Takeru Kobayashi’s net worth is $3 million, according to Celebrity Net Worth. 1 million: The number of hot dogs that Nathan’s Famous has donated to New York food banks over the last 10 years. $3.95: The price of a Nathan’s hot dog at its flagship restaurant in Brooklyn. $0.05: The original cost of a Nathan’s hot dog on Coney Island in 1916, allowing Nathan Handwerker to undercut the competition that was selling their dogs for $0.10. $292.30: The cost of the 74 HDBs that Joey Chestnut consumed to set the world record on July 4, 2018. However, back in 1916, he wouldn’t have needed to break a $5 bill — 74 hot dogs would have cost just $3.70. 40: The length in feet of Chestnut’s 74 hot dogs. Each Nathan’s hot dog is between 6.5 and 7 inches long, with a 6-inch bun. 515.25: Length in feet of all the hot dogs scarfed down by the eaters in the 2018 competition if laid end to end. 100: The number of times the Nathan’s Hot Dog Eating Contest has been held since 2016, with the 1941 edition canceled to protest the war in Europe and the 1971 contest not held to protest the war in Vietnam. 1971: The likely real year the first Nathan’s Hot Dog Eating Contest was held. Although Nathan’s and several publications will list the 1916 start date as fact, there are no records prior to 1971, and famed PR man Mortimer Matz has claimed that he and Max Rosey invented the contest from whole cloth and fabricated the history as a selling point. 500 million: The number of hot dogs that Nathan’s has sold since its launch. 50,000: The number of outlets selling Nathan’s Famous products, which are found in all 50 states and 10 countries. $3,779.16: Total cost of the hot dogs consumed at the contest if purchased from the flagship Nathan’s restaurant in Coney Island. 22,200: The number of calories Joey Chestnut consumed in 10 min. by eating a record-setting 74 HDBs, according to ESPN’s Darren Rovell. Legend has it that the Nathan’s Hot Dog Eating Contest began in 1916 as a way for four immigrant men to determine who among them was the most patriotic. The winner was Jim Mullen, who ate 13 hot dogs, according to author Jason Fagone in his book “Horsemen of the Esophagus: Competitive Eatings and the Big Fat American Dream.” Of course, if you believe the claims of famed PR guru Mortimer Matz, that’s all an elaborate fiction that he and Max Rosey fabricated to give the event more character when they first started holding it in the early 1970s, according to the New York Times. The contest is currently governed by Major League Eating and held at Nathan’s Famous flagship restaurant in Coney Island in the New York borough of Brooklyn. If you do believe the stories about the earlier start date, 2018 marks the 100th occasion that the competition has been held since 1916 — the contest was (hypothetically) canceled in protest in 1941 and 1971. It’s certainly an unusual way to make money, but competitive eating can pay well. Like the Nathan’s Hot Dog Eating Contest, many eating contests offer cash prizes. Joey Chestnut, for example, has won nearly $600,000 since his start in professional competitive eating in 2005, according to Eat Feats, an online competitive eating news resource and database. 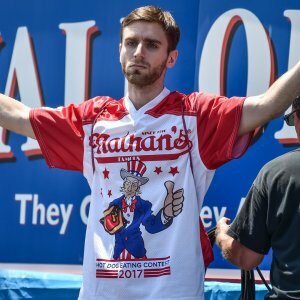 The Nathan’s Hot Dog Contest is his biggest payday, but other recent lucrative purses include the 2016 Hooters World Wing Eating Championship ($8,500) — where he ate 194 wings in 10 minutes — and the 2014 Foxwoods World Turkey-Eating Championship ($5,000) — where he consumed 9.35 pounds of turkey in 10 minutes. Much newer to professional competitive eating are Miki Sudo and Matt Stonie. Sudo has earned almost $120,000 in prize money since 2011. Her most recent first-place prize was the 2017 World Ice Cream Eating Championship, where she scored $2,000 and set the world record for short-form ice cream eating by consuming 16.5 pints in just six minutes. Stonie, meanwhile, has pulled in just more than $150,000 since 2009. Last year, he managed a $4,200 second-place payday for consuming 229 chicken wings in 10 minutes at the Hooters World Wing Eating Championship in Las Vegas less than a week after his third-place finish in the Nathan’s Hot Dog Eating Contest, besting Joey Chestnut in the process. Qualifying events for the 2019 Nathan’s Hot Dog Eating Contest have not been announced yet. If you think you have what it takes, your 4th of July party might be the time to start practicing. Regional winners of the 2018 qualifying events consumed anywhere from six to 46.5 hot dogs. Surviving a job loss is easier in some states than others. Instantly take your ramen up a notch with these recipes.